The CWA Picks for October 2013 consist of several excellent exhibitions of women artists in the United States: Chiharu Shiota at the Mattress Factory in Pittsburgh, Eleanor Antin at Columbia University in New York, and Nalini Malani at Galerie Lelong in New York. Also included are two important group shows: She Who Tells a Story, an exhibition of female photographers from the Arab world at the Museum of Fine Arts, Boston; and The Beginning Is Always Today, the first major museum survey of Scandinavian feminist art in twenty years. 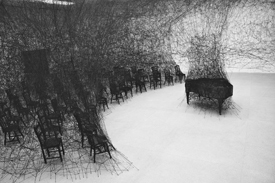 Chiharu Shiota, IN SILENCE at Centre PasquArt, Biel/Bienne, 2008, black wool, burnt grand piano, and burnt chairs (artwork © Chiharu Shiota; photograph by Sunhi Mang and provided by VG Bild Kunst). Getty Lab Cleans Jackson Pollock’s 1943 Mural—What a Difference! The president of the CAA Board of Directors, Anne Collins Goodyear, has confirmed new appointments to the editorial boards of CAA’s three scholarly journals and to the Publications Committee, in consultation with the vice president for publications, Suzanne Preston Blier. The appointments took effect on July 1 and in late August 2013. The three new members of the Art Bulletin Editorial Board are: Sarah Betzer, assistant professor of eighteenth- and nineteenth-century art and director of the undergraduate program in art history at the University of Virginia in Charlottesville; Rita Freed, a historian of Egyptian art and chair of the Department of Art of the Ancient World at the Museum of Fine Arts, Boston, in Massachusetts; and Glenn Peers, a professor of medieval art at the University of Texas at Austin. They will serve four-year terms, through June 30, 2017. In addition, Goodyear appointed David Getsy of the School of the Art Institute of Chicago in Illinois to a two-year term as editorial-board chair. The new member at large for the Art Journal Editorial Board is Juan Vicente Aliaga, a curator and a professor of modern and contemporary art and theory at Universitat Politècnica de València in Spain. The caa.reviews Editorial Board welcomes David Raskin as editor designate through June 30, 2014. Raskin is professor of contemporary art history in the Department of Art History, Theory, and Criticism and chair of the Department of Sculpture at the School of the Art Institute of Chicago in Illinois. Juliet Bellows, assistant professor of nineteenth- and twentieth-century art in the Department of Art at American University in Washington, DC, joins the editorial board for a three-year term. New field editors for the journal are: Suzanne Hudson, a historian of modern and contemporary art at the University of Southern California in Los Angeles and an active critic, as field editor for reviews of exhibitions of modern and contemporary art on the West Coast; Kevin Murphy, chair of the History of Art Department at Vanderbilt University in Nashville, Tennessee, as field editor for books on architecture and urbanism from 1800 to the present; Kristoffer Neville, assistant professor in the Department of the History of Art at the University of California, Riverside, as field editor for books on architecture and urbanism, pre-1800; Andrei Pop, assistant professor of art history at Universität Basel in Switzerland, as field editor for books on theory and historiography; and Jason Weems, assistant professor in the Department of the History of Art at the University of California, Riverside, as field editor for books on American art. Joining the caa.reviews Council of Field Editors in late August are: Andrea Bayer, curator in the Department of Paintings, Metropolitan Museum of Art, as field editor for reviews of books on arts administration and museum studies; and Tatiana Flores, associate professor in the Department of Art History at Rutgers University, as field editor for exhibitions on modern and contemporary art in New York and internationally. Susan Higman Larsen joins CAA’s Publications Committee. Larsen is director of publications at the Detroit Institute of Arts in Michigan and an adjunct professor in the graduate program in museum studies at Johns Hopkins University in Baltimore, Maryland. 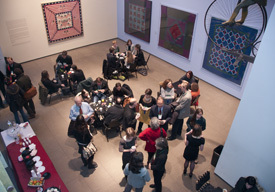 The Student and Emerging Professionals Committee hosted a breakfast at the American Folk Art Museum during the 2011 Annual Conference (photograph by Bradley Marks). For the 2014 Annual Conference in Chicago, the Student and Emerging Professionals Committee seeks established professionals to volunteer as practice interviewers for the Mock Interview Sessions. Participating as an interviewer is an excellent way to serve the field and to assist with the professional development of the next generation of artists and scholars. Interested candidates must be current CAA members and prepared to give six successive twenty-minute interviews with feedback in a two-hour period on one or both of these days: Thursday, February 13, 1:00–3:00 PM and 4:00–6:00 PM; and Friday, February 14, 9:00–11:00 AM and 2:30–4:30 PM. Conference registration, while encouraged, is not required to be a mock interviewer. Desired for the sessions are art historians, art educators, designers, museum-studies professionals, critics, curators, and studio artists with tenure and/or experience on a search committee. You may volunteer for one, two, three, or all four Mock Interview Sessions. Please send your name, affiliation, position, contact information, and the days and times that you are available to Megan Koza Young, chair of the Student and Emerging Professionals Committee. Students and emerging professionals have the opportunity to sign up for a twenty-minute practice interview at the 2014 Annual Conference in Chicago. Organized by the Student and Emerging Professionals Committee, Mock Interview Sessions give participants the chance to practice their interview skills one on one with a seasoned professional, improve their effectiveness during interviews, and hone their elevator speech. Interviewers also provide candid feedback on application packets. Mock Interview Sessions are offered free of charge; you must be a CAA member to participate. Sessions are filled by appointment only and scheduled for Thursday, February 13, 1:00–3:00 PM and 4:00–6:00 PM; and Friday, February 14, 9:00–11:00 AM and 2:30–4:30 PM. Conference registration, while encouraged, is not necessary to participate. To apply, download, complete, and send the Mock Interview Sessions Enrollment form to Megan Koza Young, chair of the Student and Emerging Professionals Committee. You may enroll in one twenty-minute session. Onsite enrollment will be limited and first-come, first-served. Sign up in the Student and Emerging Professionals Lounge starting on Wednesday, February 12, at 4:00 PM. The Alliance for Networking Visual Culture sent the following email on September 16, 2013. To follow up on our recent Beta release, the Scalar development team will be offering a series of free online webinars this Fall. Our “Introduction to Scalar” webinars will cover basic features of the platform: a review of existing Scalar books and a hands-on introduction to paths, tags, annotations and importing media. Our “Intermediate Scalar” webinars will delve into more advanced topics including the effective use of visualizations, annotating with media and a primer on customizing appearances in Scalar. Finally, one advanced webinar will cover Scalar’s RDF-based API as well as Scalar’s theme engine for programmers who wish to utilize the platform’s internal components when creating interfaces. 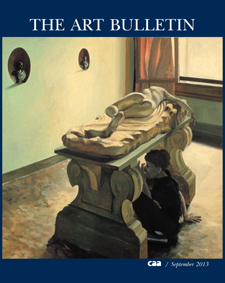 The September 2013 Art Bulletin, the leading publication of international art-historical scholarship, is the third issue of the journal’s centennial year. In the opening text, “Regarding Art and Art History,” David Summers traces his career as a trajectory of changing perspectives on art history. For the “Notes from the Field” section, eleven authors—Eric Fischl, Jan Assmann, Malcolm Bull, Darby English, Ludmilla Jordanova, Mary Miller, Steven Nelson, Ajay Sinha, Gloria Sutton, Gerrit Walczak, and David E. Wellbery—ponder the role of time in art. The September “Interview” features Partha Miller and Keith Moxey discussing the emergence of a world art history. In his essay “Graphic Knowledge,” Peter Parshall analyzes Albrecht Dürer’s treatise on human proportion to reveal a fear of the transgressing power of imagination that, he argues, ultimately hobbled the artist and his legacy. Next, Matthew M. Reeve explores Horace Walpole’s neo-Gothic villa, Strawberry Hill, showing the role of the eighteenth-century Englishman’s sexuality in the design and reception of the house. In “Rhetorics of Place and Empire in the Fountain Sculpture of 1830s Havana,” Paul B. Niell examines the reconfiguration of international forms, iconography, and materials in three public fountains erected in Cuba during the 1830s to show how a burgeoning Atlantic world city negotiated its relation with the Spanish Empire and its emerging distinctiveness as a local setting. Finally, Namiko Kunimoto considers the Japanese artist Tanaka Atsuko’s Electric Dress in relation to a changing urban and industrial context in postwar Japan that provoked shifts in the status of gender, underscoring the frailty of female subjectivity. In a “Centennial Review Essay,” H. Perry Chapman discusses what she calls the “problem with artists” by reconsidering two influential books: Ernst Kris and Otto Kurz’s Legend, Myth, and Magic in the Image of the Artist: A Historical Experiment (1934); and Rudolf Wittkower and Margot Wittkower’s Born under Saturn: The Character and Conduct of Artists; A Documented History from Antiquity to the French Revolution (1963). Then, Jacqueline E. Jung assesses Herbert L. Kessler and David Nirenberg’s edited volume, Judaism and Christian Art: Aesthetic Anxieties from the Catacombs to Colonialism, alongside Nina Rowe’s The Jew, the Cathedral, and the Medieval City: Synagoga and Ecclesia in the Thirteenth Century. Last, Peter Chametzky considers a recent exhibition and publishing project on a German art critic, which includes Konstanze Rudert’s catalogue, In the Network of Modernism: Kirchner, Braque, Kandinsky, and Klee … Richter, Bacon, Altenbourg, and Their Critic Will Grohmann, and Rudert and Volkmar Billig’s anthology, Will Grohmann: Texte zur Kunst der Moderne. CAA sends The Art Bulletin to all institutional members and to those individuals who choose to receive the journal as a benefit of their membership. The next issue of the quarterly publication, to appear in December 2013, will feature essays on the artists Frederic Church and Awa Tsireh, Vasari’s alleged account of Roman Jews “adoring” Michelangelo’s Moses, and the contested status of color in Indian nationalism, among other topics.